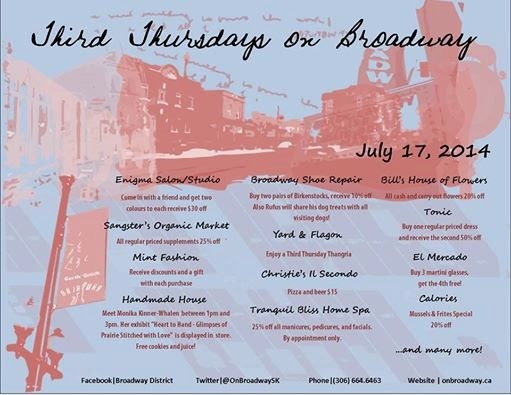 On the 'Third Thursday' of this month, merchants on the trendy Broadway Ave in Saskatoon will feature some special deals and attractions. I'll be at Handmade House for the afternoon for a 'meet and greet'. It's totally informal. The shop is quite small so we'll have a refreshment table out front. 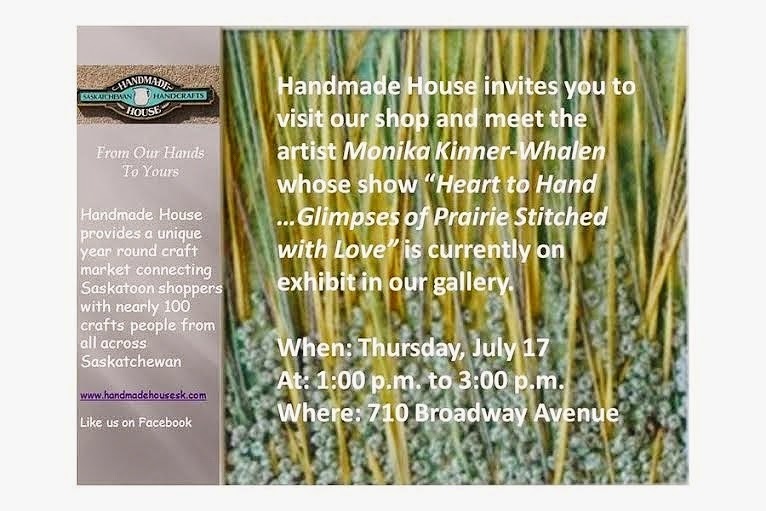 If you want to talk about the prairies or stitching, please come on over and say hello. I'm there to answer question about my work. That's as big as I can get right now of this poster. It's very difficult to read the fine print, but you can see more at their FB page (Broadway District) or their website (www.onbroadway.ca). Below is the ad that the fine folks at Handmade House made for the event. I will have a draw prize, so don't forget to enter! Then I will be off to the Battlefords for the Handcraft Festival. I'll be one of the demonstrating craftspersons set up outside in a huge tent. My little helper and I will be doing free motion stitching (thread sketching, thread painting) and hand embroidery too. Try your hand at french knots? Draw your name with my sewing machine? : ) My time slots are Friday from 12:30 to 3:30, and Saturday from 2 - 5. Maybe I'll see you then? ps- I noticed that my blog has some 'broken' link images when I view on my laptop. They work just fine when I view on my phone. Very odd. I will work on this. If you get the blog posts sent to you via email, can you let me know if you are able to view the inserted images? THANK YOU! You are so welcome. I often feel that blogging takes time away from producing. Well... it does. But I keep believing it has other benefits. P.s. I was raised by a single mom, artist. I will tell her. You made her day! Sorry we will be away attending our daughter's wedding otherwise I would have stopped by to see you and your work in person. I eeceive your inspiring messages by email, and yes, the images come through just fine! Thanks for a great blog! A quilting friend of mine saw the Prairies exhibition when she was in Edmonton last month. I told her to watch for your work:) She fell in love with your flowers in the ditch piece! Then she stopped at Handmade House in Saskatoon to see your work and was blown away! I was not surprised. Wow Juanita! Thanks for letting her know. That's really great!